Over the last week, I have had live conversations with a few brands, individuals and marketers on the topic of social media content strategy. After receiving multiple questions from the various parties on these calls, I thought a new analogy to explain social marketing was needed. How often should we post on social media? What kind of content should we be posting? Do these questions sound familiar? They should. They are the cornerstone to being effective with social media marketing. If your livelihood depended on being good at fishing, you should probably know what kind of fish you need to catch. If you know what kind of fish you want to land, you had better know what type of bait they are attracted to and use that to fish with, rather than whatever you happen to be hungry for. If you’re going to be successful at catching fish, there are a few things you need to do. 1) Know what type of fish you are wanting to find, attract and catch. 2) Know what live bait, lure or tackle those specific fish are attracted to. 3) Have the appropriate lb test line that will support the fish size you are trying to catch. 4) Have the proper fishing poles, reels and other gear needed to catch and land the type of fish you are looking for. 5) Know where to find the fish you are trying to catch. 6) Have your fishing pole in the water at all times. 7) Have more than one fishing pole in the water at all times. If you are fishing every couple of days. rather than every day, your chances of attracting or catching a fish is far less likely. If when you fish, you cast once, reel in and then go home, you are definitely not going to be successful. If the bait you have on the end of your line is a sandwich, but the fish you are trying to catch only hit on worms, you will not catch any fish you are targeting. In social media, you are fishing with content. You need to know what your target audience (type of fish) is interested in and share that content (bait) 80% of the time. Posting only a few times per day on social media will ensure a tiny percentage of your audience sees anything you post, therefore you need to have poles in the water all day, everyday to increase the likelihood your posts (lines in the water) are seen. 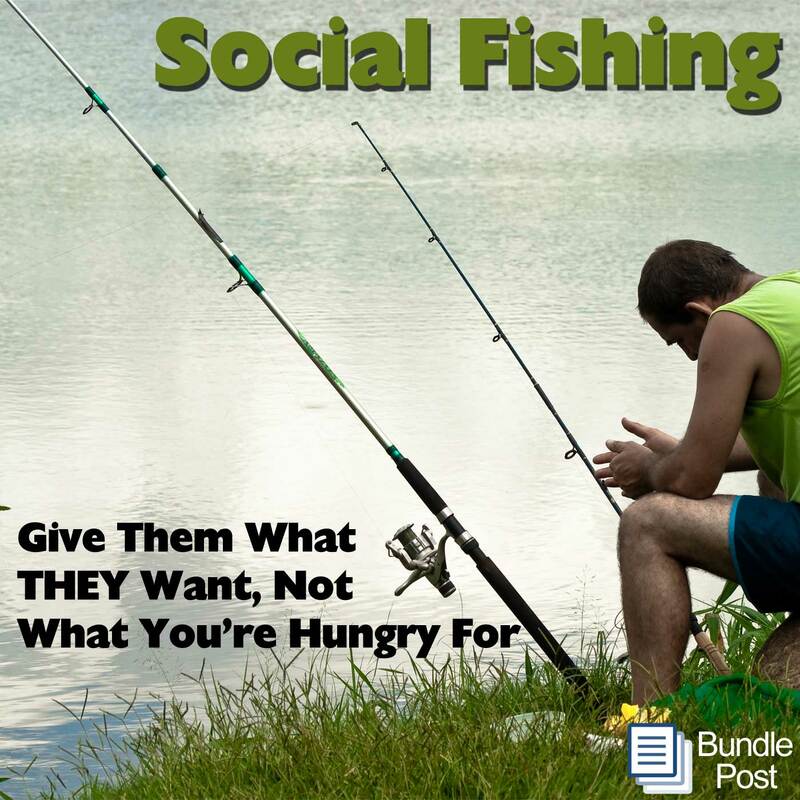 If you are fishing in social media, using content, graphics and status updates that are only about you, your brand or your content, it is like fishing for cod using a sandwich you want to eat. You must share content that your target audience is attracted to and get’s them to bite. Your posts need to be everyday, all day and of the variety that your target audience responds, clicks, shares, comments or likes. When you have a fish on, you slowly reel it in. If you try to immediately land the fish, you will likely pull the hook out and/or break the line. You must patiently work the fish by reeling it in slowly (having conversations and building the relationship). When you have skillfully and patiently brought the fish to the side of the boat, you can bring it INTO the boat. If you’ve done this well, some fish will gladly hop right into your boat for you by asking what you do, requesting information or signing up on your website. Some fish will require a net and more careful attention before trying to bring them into the boat. At the end of the day, be sure you are giving your fish what they want, and not chumming the water with your food, leftovers and interests.